Look Up Ahead, I See The Ukulele Land, Soon You'll Understand. It’s official! I don’t get out much! “Who’s Kev?”I can’t say that I was very impressed with the hotel we stayed in at Cheltenham. What a dump! There was a sign on the wall in reception that read along the lines of: “Please don’t abuse the staff… They’re here to help you.” The hotel was one and three-quarters of a mile from the centre of Cheltenham. It was a walk I was to do many times. 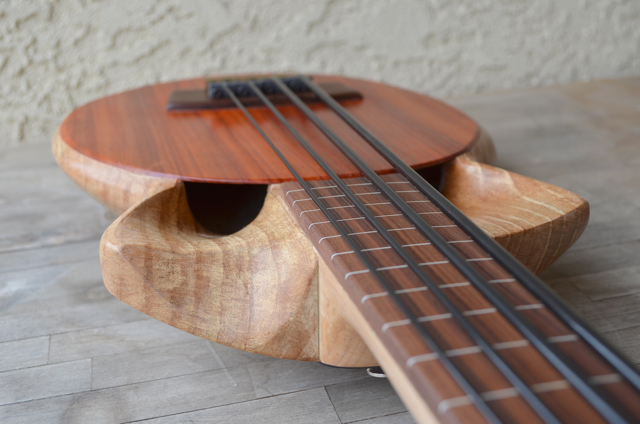 We have been talking to David Iriguchi at iriguchiukuleles.com and he has kindly allowed us to tell you some more about this amazing bass ukulele, the Cthukulele… The words and pictures that follow are his, but we are sure you will agree, this is an amazing looking instrument. 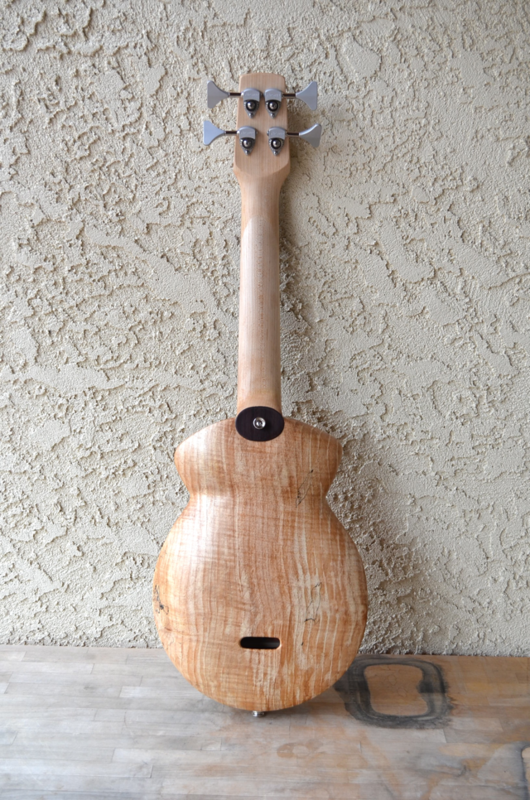 The Chtukulele will make her public debut at the 2013 Reno Ukulele Festival in Sparks Nevada, April 11-14, 2013. Hewn from a single split piece of spalted maple the Chtukulele’s body is an ergonomic masterpiece (how’s that for some nice hyperbole!). 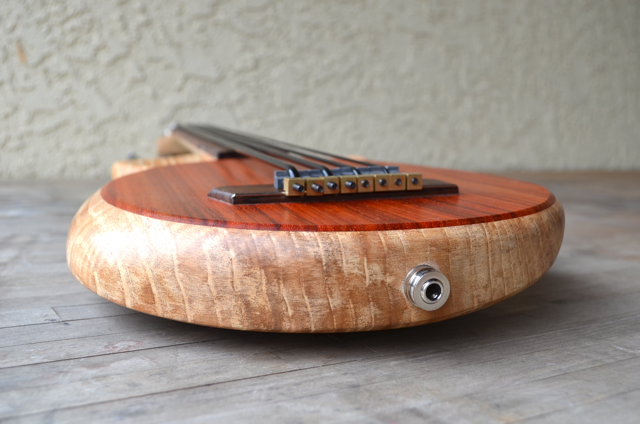 The semi-hollow body is extremely rigid and gives the Padauk soundboard a solid foundation to vibrate off of. 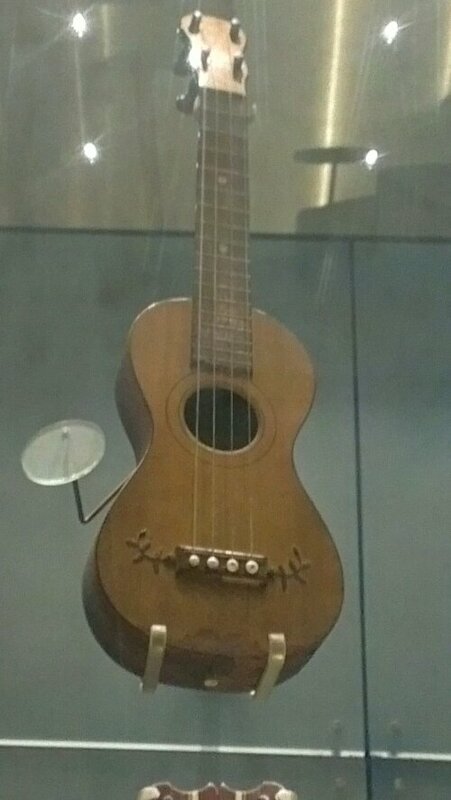 The Cthukulele gets her name from H.P. Lovecraft’s Cthulu, another creature not of this Earth. From the top you can see that the body is just two inches deep and it is nothing but smooth curves. The top edge where your right arm rests is part of the body and not part of the soundboard so your arm does not rest on the soundboard. 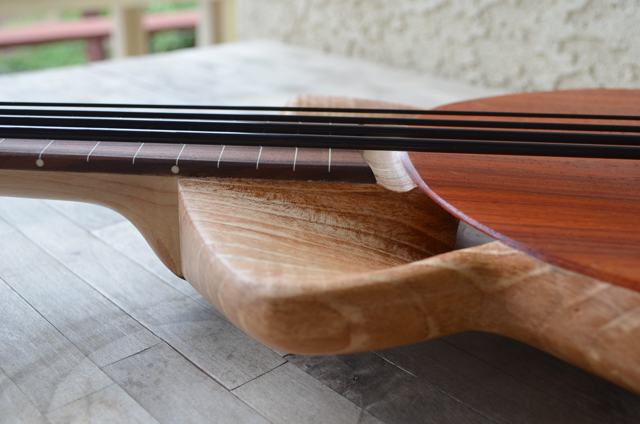 Whether you are sitting or standing the Chtukulele is very comfortable to hold. 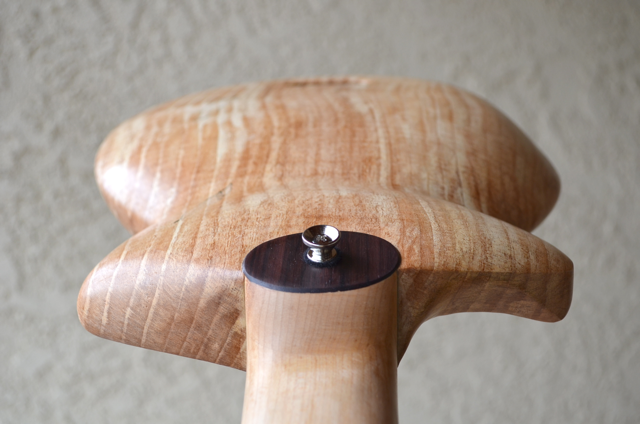 It sits very close to your body and all the contact points are smooth and rounded. 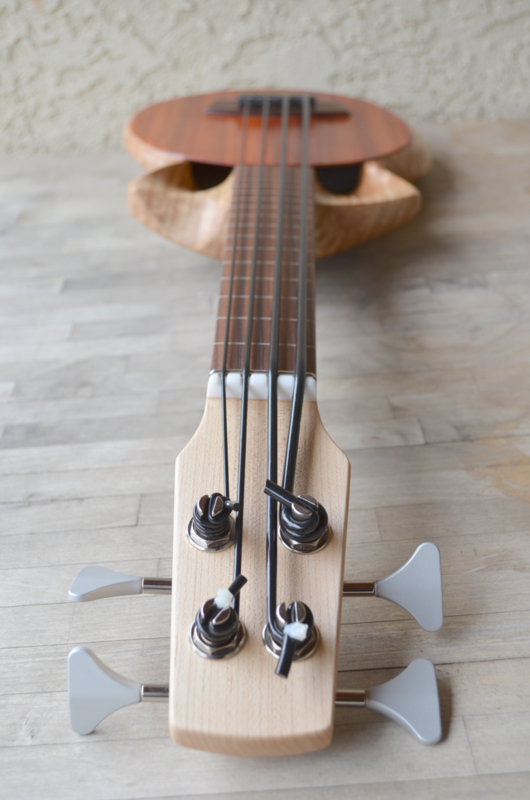 This end view shows the Cthukulele’s unusual profile. The angled side (to the right in this image) rests flat on your thigh when sitting and playing. Extraordinary comfort. The spalted Maple has a wonderful ‘dirty’ patina. The small port in the lower bout is to insert the strings. 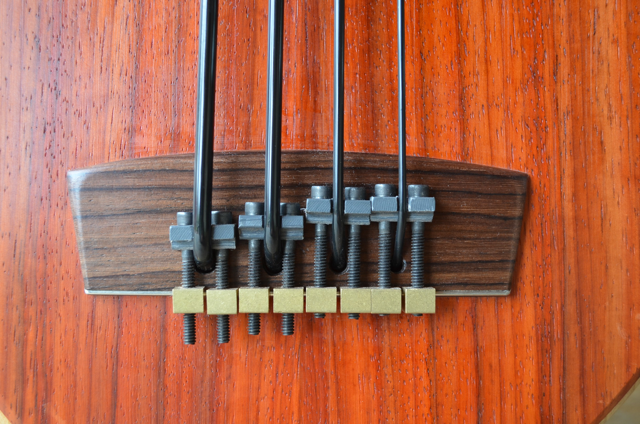 The strings pass through the soundboard and easily fit through this port. 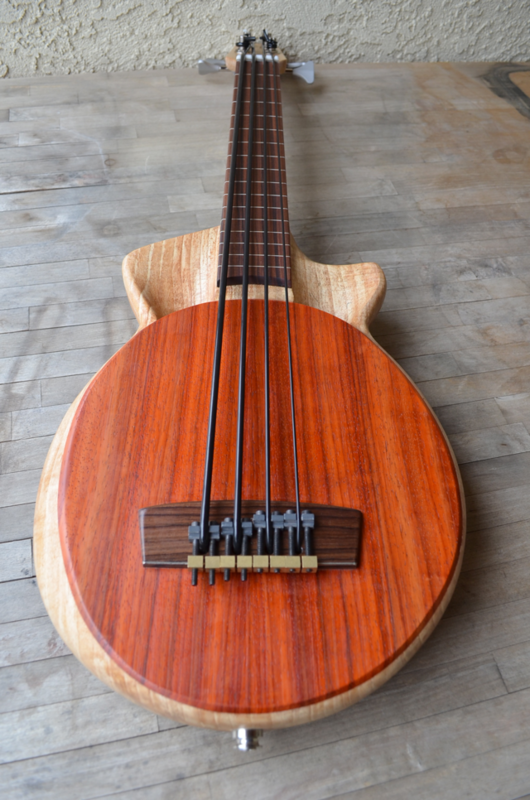 The Chtukulele uses dual “Jet Intake” soundholes. These ports are carved into the upper bout. With this design we don’t have to cut a hole in the soundboard. Because of this, the soundboard is suported all the way around which allows us to lighten up the bracing. Plus it looks wicked cool, right? It is this view that gives the Chtukulele it’s name. The ports are quite deep and there is also a channel below the end of the fretboard. 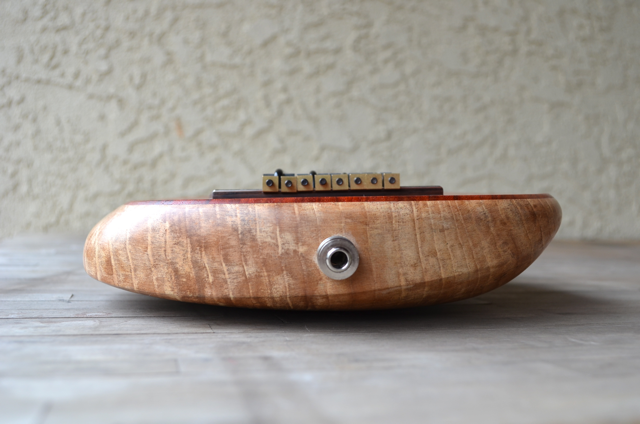 We are currently designing an acoustic semi-hollow ukulele with these Jet Ports. 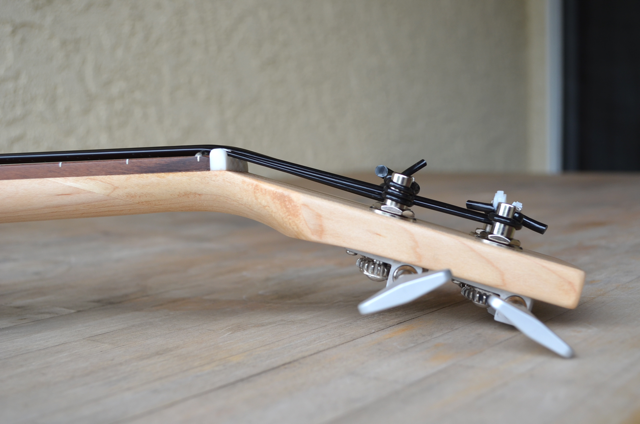 There is a cutout in the body to give access to the highest frets. 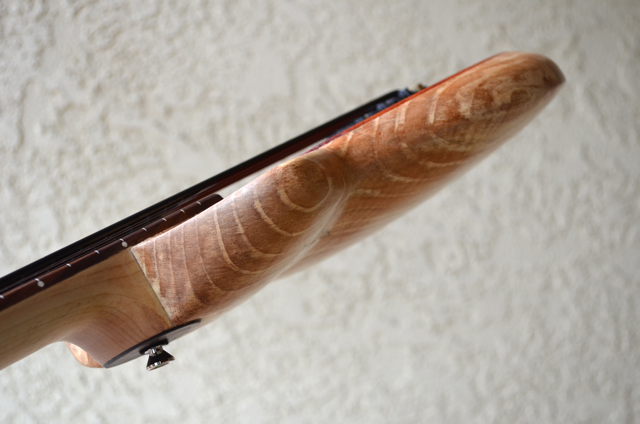 The Maple neck is inset into the body about 9mm. The adjustable bridge is our own design. It allows 12mm of compensation adjustment, from -3mm to +9mm. The compensation is very easily adjusted using a 2.5mm allen wrench. 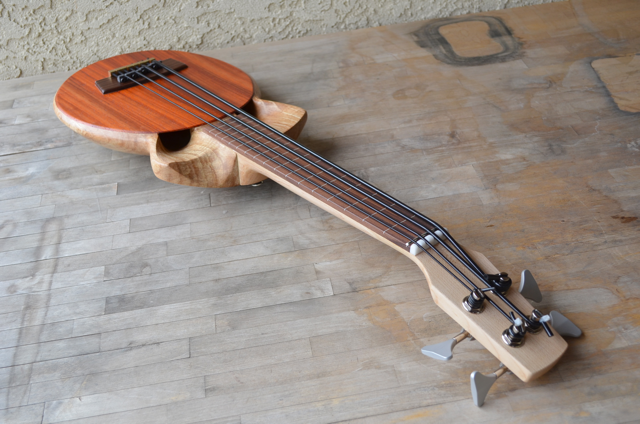 As with our other ukuleles we used a zero fret on the Chtukulele. This allows us to make a much lower profile nut. 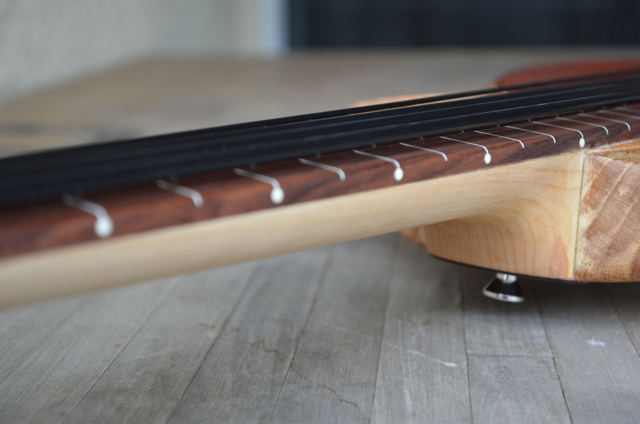 The Chtukulele is fretless and has white styrene fret markers. There are also side markers at 3, 5, 7, 9, and 12. 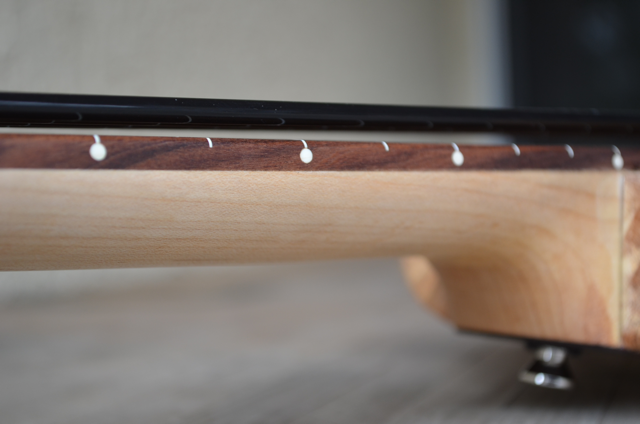 The Maple neck uses our ‘comfort’ profile. It is bladed so that it is slightly thicker at the G-string edge and tapers smoothly to the E-string edge. The bridge has a very flat appearance and there is a K&K Sound Big Twin pickup installed. In this view you can see that the arm rest is part of the body and not the soundboard. The bridge adjusters attach to the edge of the bridge and can slide horizontally. We use standard Hipshot Ultralight tuners instead of the spooled style. A ziptie is used to secure the string in the tuner because those polyurethane strings are slippery little buggers. The zipties work just great though and we like the standard tuners a lot better than the spool style. 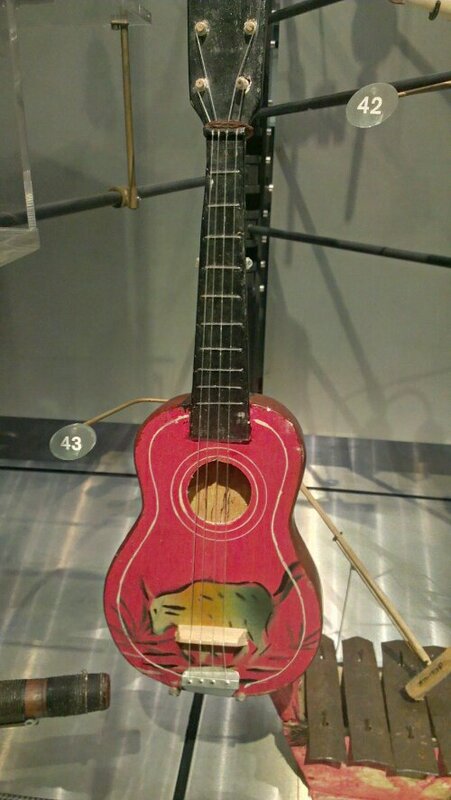 So there she is, the evil-looking Cthukulele! A strange creature not of this world. 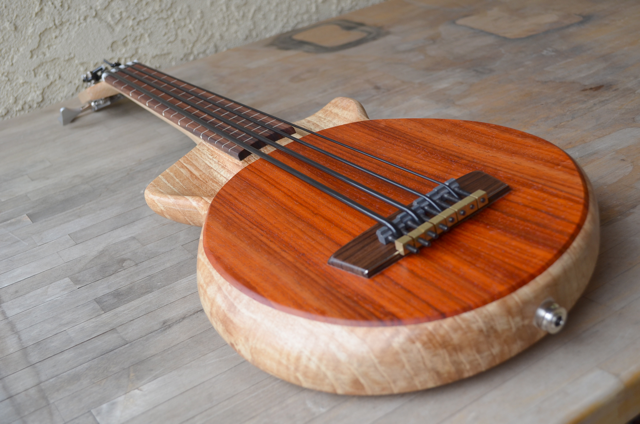 Just spotted this video of a very different kind of electric ukulele. This one is electric in it’s method of playing. Well, possibly more electronic. It is built using an arduino, a mobile phone vibration motor, and a servo. Pretty clever, huh? I just found this video of 2 chaps playing ‘No One Knows’ which was originally recorded by Queens of the Stone age. Apparently they are busking on the Royal Mile in Edinburugh, but who are they? If you know anything about them, please leave us a comment……..
Every now and again, we come across something we like that just has not been seen by enough people. This guy, Lunarbeef, doing a cover version of ‘Killing in the name of’ by Rage against the machine, has got balls bigger than king kong. We totally approve. Craig, if you read this, we love your work! 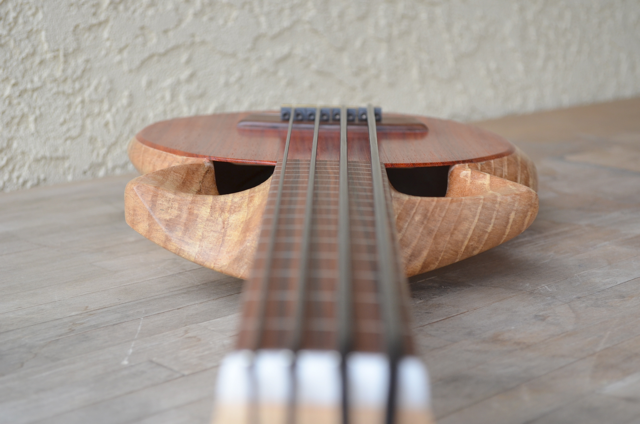 I kept seeing ukes all over the place…. Out and about in Forest Hill on Friday during the day and around The Tower of London in the evening, and I couldn’t stop spotting ukuleles and related instruments. 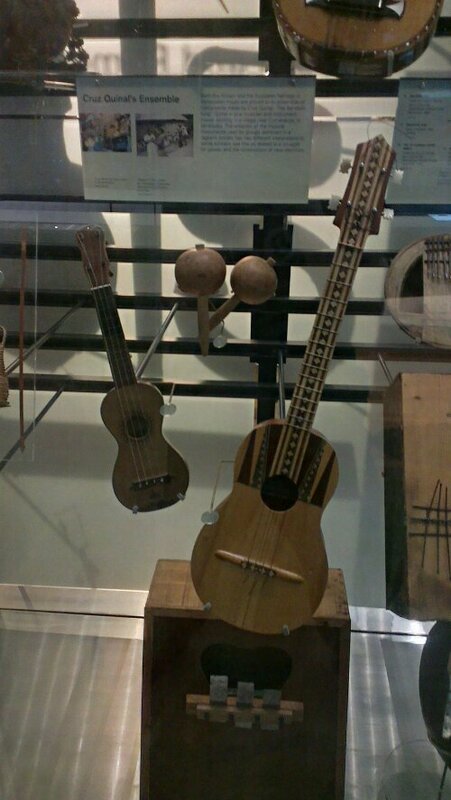 The instruments you can see in cabinets are at the Horniman Museam in Forest Hill, South-East London. More information about them and the hundresds of other instruments in their gallery can be found in their catalogued web page. This is Bobby from the Indonesian band Marjinal playing ‘Negri Ngeri’ on my Risa Tenor stick. It is an Electric uke made to travel that I took with me to show Bob when I visited Jakarta earlier in the year, Bob was really good to me, we spent the whole day together, he showed me around, talked about the street kids and music and how different our relative places in the world are. Thanks Marjinal, you ROCK! My mate scully is quite the genius when it comes to electronics and biscuit tins. Here is a video we just made of his brand new canjolelel / electrolele / futulele / iUkelele / tabulele / phoneulele / ukulele hero machine. It is made with a Cadbury’s biscuit tin, a plank of wood, an iPad 3, an iPhone 4, and a bit of masking tape. Oh… and a funky bit of software called futulele which runs on both the ipad and iphone and connects them together to act like the neck and the body of the uke. A group of friendly street punks in Indonesia’s capitol, Jakarta. We had heard the punk ukulele scene in Jakarta was big. We bumped into these punk kids the first time we went out for a walk around and they were happy to let us record them playing uke. In the few days we were there, we meet more new ukulele friends than you ever could have expected. 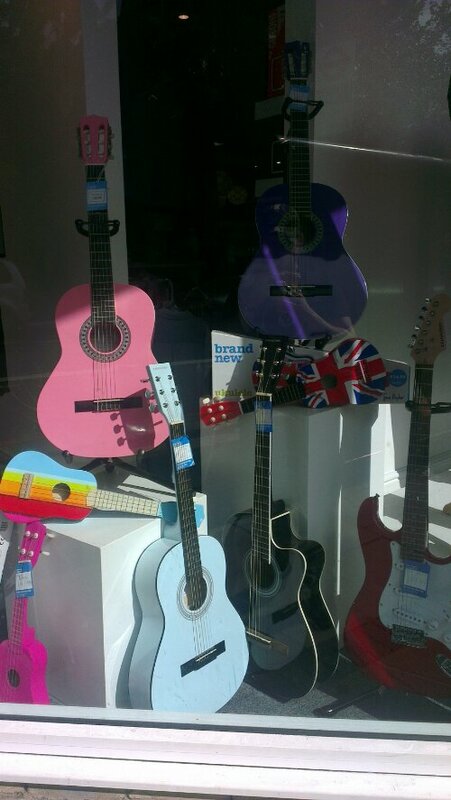 It seems a uke to these kids is like a PSP or a blackberry is to kids in the UK. It gives them amusement, entertainment and above all, a voice to tell everyone else about how they see the world. 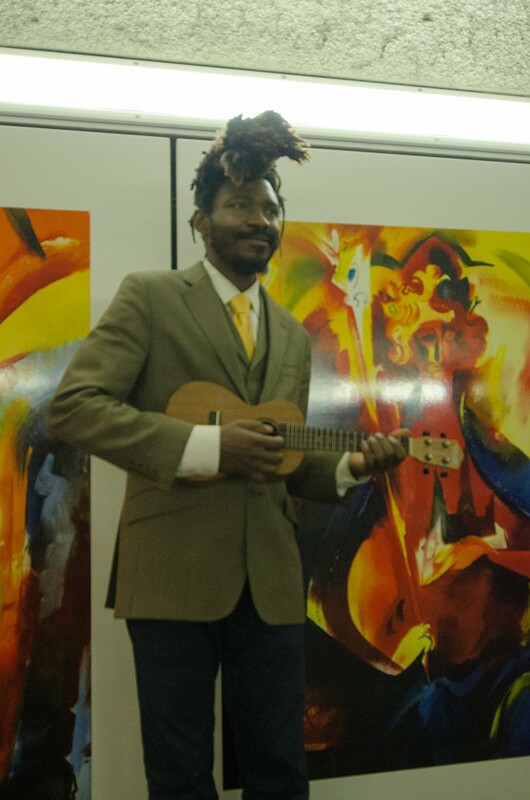 In the promo, they show a lot of photos of kids playing ukulele, and they describe the work that Marjinal do and the activities the get involved in to help others understand more about them. 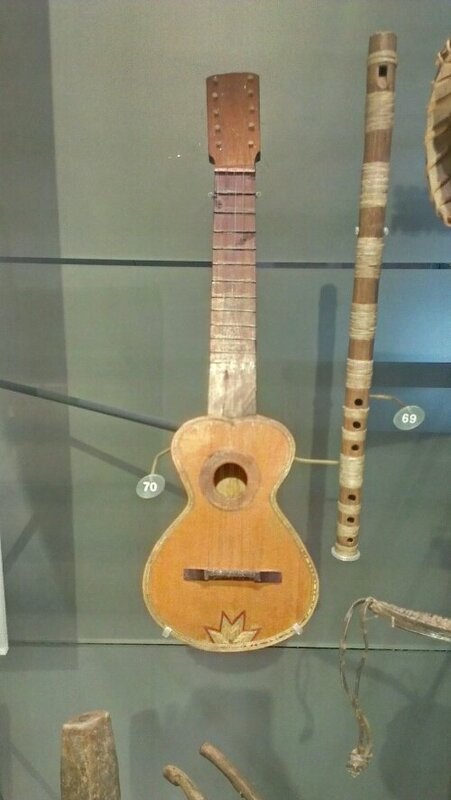 Barry Maz's "Got a ukulele?"